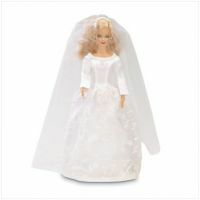 The Bride Fashion Doll is a great accompaniment to any little girl's doll collection. Let your imaginative princess thoroughly enjoy pretend romance and make-believe by giving her the gift of the splendid Bride Fashion Doll, complete with gorgeous wedding gown! Ages 3+.